After several years of notoriously skipping on any dividend payments to reward shareholders, Apple's new CEO Tim Cook has said the company will kick off a dividend and share repurchase program later this year. The announcement was made during a conference call with analysts and members of the press this morning, where Apple discussed how it plans to use its nearly $98 billion cash stockpile over the next few years. As part of the plan, investors will receive a quarterly dividend of $2.65 per share starting in its fiscal fourth quarter, which begins in July. That works out to $10.60 annually, or 1.8% of the current stock price, and will cost the company about $10 billion a year. The move will make Apple one of the largest dividend payers in the United States, a stark departure for a company that last offered a dividend to shareholders in 1995. The Cupertino-based giant will also buy back $10 billion of its own shares over three years, beginning in October. Apple said the share buyback will reduce the number of shares outstanding, thus helping stave off earnings-per-share dilution from future employee stock grants and purchase programs. Apple estimates it will burn around $45 billion through 2015 on its dividend and share repurchase program. The firm is using its domestic cash, rather than the much heftier stockpiles it holds overseas, because foreign cash would be subject to a sizable "repatriation tax" if brought back into the United States. "We have used some of our cash to make great investments in our business through increased research and development, acquisitions, new retail store openings, strategic prepayments and capital expenditures in our supply chain, and building out our infrastructure. You'll see more of all of these in the future. Even with these investments, we can maintain a war chest for strategic opportunities and have plenty of cash to run our business." 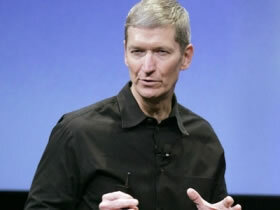 In late January, Apple reported profit of $13 billion on revenues of $46 billion for fiscal Q1 2012. The iPhone and iPad maker has already surpassed Exxon Mobil Corp. as the world’s most valuable company, and with a market value of $545.97 billion, it's worth more than Microsoft and Google combined. Put in other words, it's a great time to be an Apple investor.